What Does Art Look Like in the Montessori Classroom? Your child is an individual. His or her learning and development is important to you. That’s why you’re taking your time, finding the “just right” educational environment for your child. Even though there are a seemingly endless array of schools with different educational philosophies and curriculum-focused programs, a Montessori education is a choice that can benefit your child for a lifetime. Part of the Montessori experience is the opportunity for children to express themselves creatively through art. Art isn’t just all finger paintings and clay play. It’s a way for a young child to explore, make discoveries ,and develop critical skills. If you understand the types of art activities your child chooses to participate in at school, you can better understand what he or she is doing all day. It can also help you to continue the education at home with your own Montessori-inspired art activities. What does art look like in the Montessori environment? It doesn’t look like worksheets with perfect inthe-lines crayon colorings. Take a look at what you can expect from the Montessori classroom’s art activities. Instructing the students to sit and color portraits,or paint pictures of their homes or collage flowers isn’t how art in the Montessori classroom works. Teacher-directed art-making may be the norm in some schools, but in Montessori schools the emphasis is on encouraging the students to make their own choices and explore for themselves. Instead of telling the students, “make this” or, “don’t make that,” the Montessori teacher provides plenty of options and the freedom to choose. The teacher might place an array of art materials or activities on a low shelf. 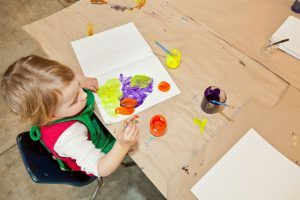 The children can then choose what activities they want to do and decide on how they’re going to use the art materials. This method of art education allows for plenty of experimentation, spontaneity and freedom through creativity. What types of materials will you find in the Montessori classroom? There is no easy answer to this question. To start with, teachers typically provide a variety of materials. Again, this offers the chance for children to choose what they use. Many of the materials you’ll find in a Montessori classroom are open-ended. This means that they don’t have one “use.” Instead of using coloring pages that require the children to add specific hues in specific spots, open-ended art materials allow for multiple different uses. For example, a tray of brightly colored paints with different sizes of brushes and rollers provides plenty of opportunities for the children to paint in any way they choose. They can mix colors, splatter the paint, swipe long lines, roll different textures or even finger paint. Along with paints, you’ll find that plenty of other art materials (including ones that you may have at home) have open-ended uses. Your child can draw with a set of crayons, make abstract lines, unwrap them and roll them over the paper or dot them onto delicate pieces of tissue paper. Modeling clay is another material that is easy for children to experiment with. They can sculpt with it, spread it out finger paint style, press other items into it or get creative and make patterned textures with craft sticks. Materials are often presented on trays together in montessori schools, creating an aesthetically appealing array for the child to choose from and use. Art in the Montessori classroom isn’t designed come with the intention to hang a mini masterpiece on the fridge. You can always display your child’s art, but the idea is to let your child create and not to force him or her into making ‘something special’ for you. Supporting creativity takes time, patience and the willingness to step back and let the child explore without your direct help. Think of art as a hands-off activity for you and a hands-on activity for your child. If you’re interested in learning more about Montessori and how it can benefit your child, Joyous Montessori has answers to your questions.